on the ground for long! greyish; males maybe brighter brown. how well they fit down their little throats! "...daintily picking up a Cheerio..."
:-) I love your poem. 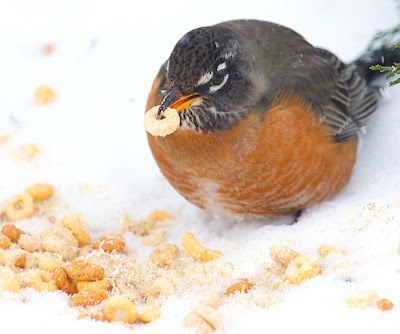 It perfectly captures the action of robins gobbling up their breakfast! Thank you, Kelly. :) And thank you again for your wonderful photographs!